It’s fair to say, I don’t have a gift for happiness and it’s never occurred to me to collect good days, but Albert was inspiring and I got up on Wednesday and said to Mark, “Let’s try to make this a really good day!” He looked at me like I’d sprouted antlers. Owen has a gift for happiness. That, or he’s crazy. Later, Mark and I took a walk through the countryside and in the course of an hour encountered sheep, hedgerows, a medieval church, meadows, pheasants, Peter Rabbit, forest glens, and gurgling brooks. It was almost sickening, how beautiful it all was. I always thought I had an overly romantic image of the English countryside from poetry, novels, and Masterpiece Theater, but no. Very realistic. After our walk, the whole family went out for fish n’ chips at a pub. Did you know that fish n’chips are often served here with a plate of bread and butter? Along with deep-fried fish and a pound or so of fried potatoes, you will be served a couple of slices of downy white sandwich bread and a few foil-wrapped packets of butter. As an American I’m in no position to cast stones, but it seems like there’s room for improvement in the British diet. It would have been a day for a collection of good days, if I had one. We fly home today. I visited Conwy a long, long time ago (1989), and you describe exactly what I remember: sheep, hedges, meadows, bara brith, fish 'n' chips with bread and butter... I loved the castles, cathedrals, landscape, and baked goods. Some of their food concepts were puzzling: have you encountered the chip buttie yet? This is a potato sandwich -- two slices of bread and butter with chips in the middle. I never tried it but I'm sure it's very filling. I'm glad you had this good day to cancel out your bad restaurant experience. I might excuse supercilious, neglectful service if the food was good, but it sounds as if it was a dismal experience overall. I saw chip buttie on one menu, but didn't pursue. It sounds like I should have, just for the experience. I think Conwy was the highlight of our trip. A good friend recommended the audio book, and it was one of the best I've ever listened to. I, too, was reminded of the book by the giant hearth comment. We should all strive to "collect good days"... to make the most of each day, to be kind to others. Thanks for the reminder. I need to put up a reminder on my refrigerator. It's never too late to start collecting good days! This was such an uplifting post that I declared that all would have a good day at my house today. Thanks for that! 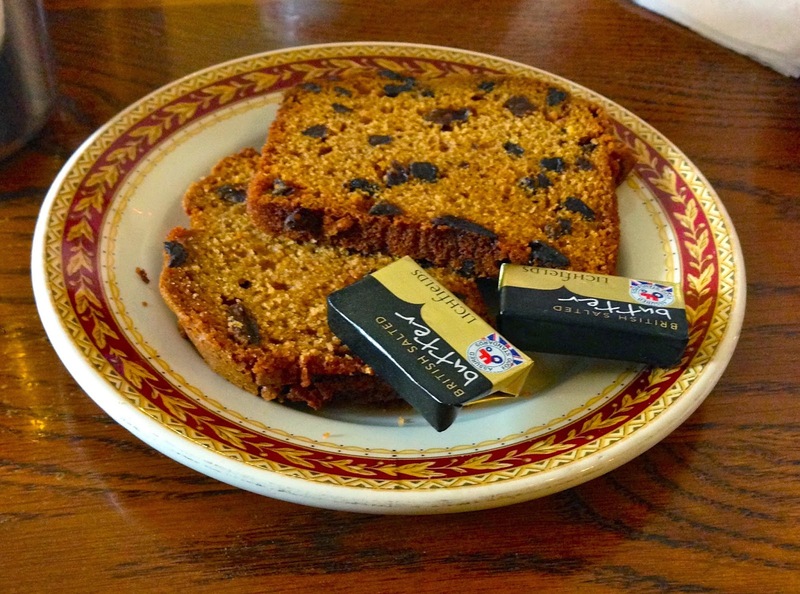 As I am a real sucker for anything that contains dried fruit, I will have to make some bara brith soon. I hope you collect another good day on your way home. Thanks! I think I've had a few good days since, but I forgot about my collection. That is absolutely fascinating. I had no idea. And George Orwell even weighed in. I need to print that out and read at leisure. Love Kate Atkinson, I hope you have read/will read/want to read everything else of hers. Except "Emotionally Weird"...couldn't finish it. She is an exceptional writer. I think she's my favorite writer, the Jackson Brodie series especially. I've read the JB books multiple times trying to figure out how she weaves together the intricate plots. I've never read Emotionally Weird -- I'll cross it off the list. You'll have a good day after watching this, I'm sure. That's hilarious! Fortunately, our goats sound less human.